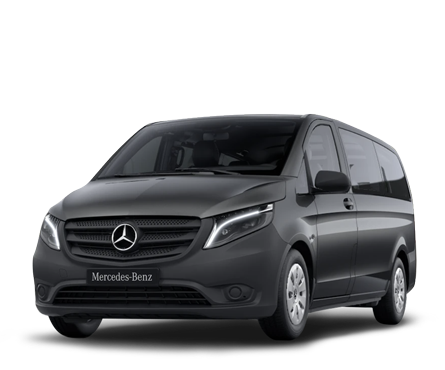 Explore our fleet of Volkswagen and Mercedes people carriers and minibuses. We have chosen a wide range of seven-, eight- and nine-passenger high-end, luxury tourism vehicles that are less than 24 months old. We promise a specific model, rather than just a vehicle from a certain category. WeVan is France's leading specialist in minibus hire. We've chosen and configured seven-, eight- and nine-passenger high-end, luxury vehicles to meet the specific needs of our professional business and individual customers. This means our fleet features vehicles with standard transport industry amenities, including automatic transmission, leather upholstery, tinted windows, metallic black paint, two side doors, lounge mode, extra-long wheel-base and cargo space, depending on the model. Each agency's team throughout France is ready to connect with you to learn more about your business or what you're looking for so they can assist you in selecting the most suitable rental minibus.